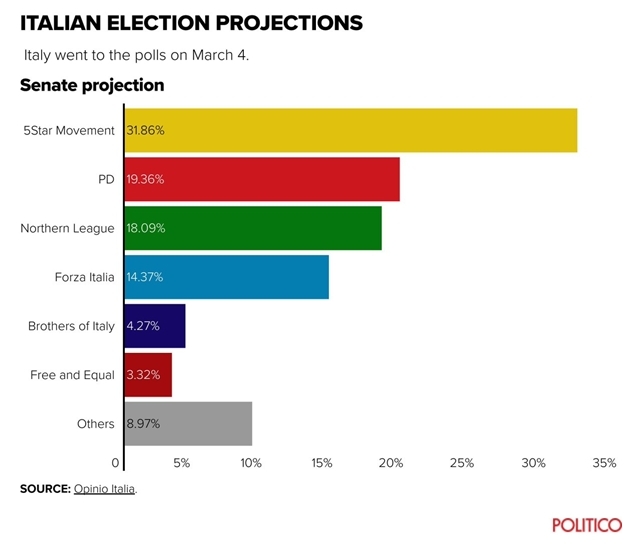 Media coverage has generally portrayed the reactionary populist Five Star Movement (5SM) as the big winner of the Italian parliamentary elections. This is false. The losses registered by the centrist Democrats were significantly greater and the gains for the overtly racist Northern League were more than double those for 5SM. In reality the outcome of the election was a marked shift from the centre-left to the right and far right. It was above all a spectacular defeat for Blairism in the Italian context, and a surge of the far right. The table below shows the percentage of the popular vote for each of the main groupings in the 2013 general election versus the preliminary media reported vote in 2018. 5SM is the biggest single bloc in the new parliament. It has described itself as populist. It is a member of the same European parliamentary grouping as UKIP, and is vocally anti-immigrant. But the Lega Nord is even more so, and maintains an electoral pact with Berlusconi, making their alliance the strongest grouping in the new parliament. The entire campaign was run on a racist basis, with parties vying to outdo each other with threats to refugees and immigrants, including mass deportations. This agenda naturally played into the hands of the most racist party of all, the Northern League, which eclipsed its Forza Italia (roughly, ‘Go on Italy’) partner. The biggest losers of the election were the Democrats, which bills itself as centre-left but is more akin to Blairism without the restraint of any connection to the labour movement. This is a Blairite catastrophe, even if the more current ‘centrist’ label is used. Centrism/Blairism is incapable of defending the living standards of the population at a time of crisis as this entails taking some measures which are not approved by its big business backers. Instead, it slides easily and directly into the anti-immigrant rhetoric which dominated the campaign. It is being met with one defeat after another in Europe. Socialists take no comfort from the fact that a rotten social democracy is being supplanted by forces well to its right. 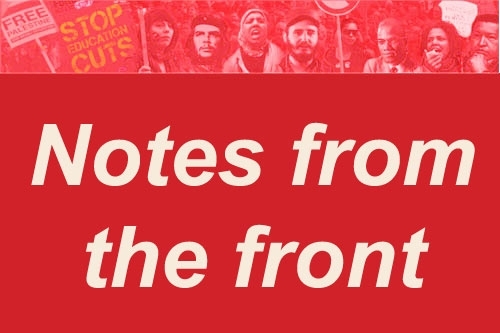 But experience in Britain shows that the only way of standing up to the far right lies through a left political leadership which opposes austerity, and refuses to go along with the racist scapegoating that covers for it. Italy needs a political alternative akin to Corbynism, which will stand for the interests of workers and the oppressed and defend their living standards. Yesterday the result of the Social Democratic Party’s (SPD) internal referendum was announced. 239,604 (66 per cent) votes were cast endorsing a new coalition with Angela Merkel’s Christian Democrats (CDU) and the Christian Social Union (CSU) – its Bavarian sister party. The turnout was 78 per cent of the 363,494 eligible party members. The result ensures that Merkel will now be reappointed as Chancellor. However this new grand coalition will not be particularly strong. The combined vote share of its constituent parties (SPD, CDU, CSU) has fallen from 67 per cent in 2013 to 53 per cent at the September 2017 election, and support for the SPD has further fallen since September so that the combined coalition parties are already below 50 per cent. The SPD decision marks the third time since 2005 the SPD has agreed to prop up this right wing Chancellor. Following both previous coalitions the SPD significantly suffered at the polls. After the 2005-9 coalition it lost nearly a third of its previous national vote share (falling from 34.2 per cent in 2005 to 23 per cent in 2009). After the 2013-17 coalition it lost nearly a fifth (falling from 25.7 per cent in 2013 to 20.5 per cent in 2017). September’s result (20.5 per cent) was the lowest vote ever recorded by the SPD in any election in West Germany or the reunited Germany. The SPD has already since September’s election lost further support as it discussed propping up Merkel in office again. DeutschlandTrend poll reported on 15 February SPD support at just 16 per cent and on 1 March at 18 per cent. Further damage should be anticipated from pursuing its current right wing’s agenda. In Britain Jeremy Corbyn’s leadership has saved Labour from the collapse being suffered by the SPD and other right wing social democratic parties. Corbyn’s Labour has been defending people’s interest, due to his opposition to austerity, racism and war. At the June 2017 election he led Labour to achieving a 40 per cent vote share, which the party has sustained in opinion polls since. If Labour’s right wing took back the party leadership their agenda would ensure a collapse in electoral support. Supporting the Corbyn leadership in Britain is the best way to maintain Labour’s advance.